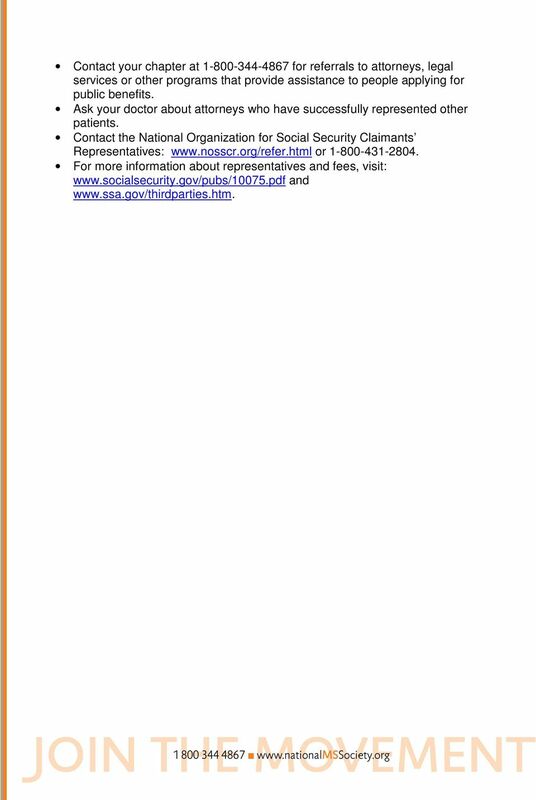 Download "Social Security Disability Resources For Self Advocacy"
2 Get organized before you apply. Find assistance if you need it. Determine what information you will need to apply. Begin to collect the information you will need for your application, and keep all materials in a folder. Keep a detailed journal. Information available at: See pp Meet with your doctor. Once you have decided to apply for disability benefits and done your homework, make an appointment with your doctor to discuss your application. You will need your doctor s support. 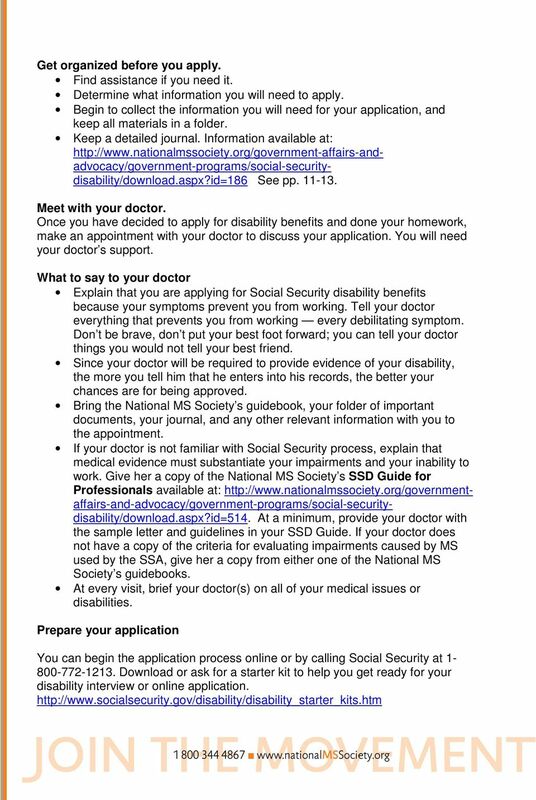 What to say to your doctor Explain that you are applying for Social Security disability benefits because your symptoms prevent you from working. Tell your doctor everything that prevents you from working every debilitating symptom. Don t be brave, don t put your best foot forward; you can tell your doctor things you would not tell your best friend. Since your doctor will be required to provide evidence of your disability, the more you tell him that he enters into his records, the better your chances are for being approved. Bring the National MS Society s guidebook, your folder of important documents, your journal, and any other relevant information with you to the appointment. If your doctor is not familiar with Social Security process, explain that medical evidence must substantiate your impairments and your inability to work. Give her a copy of the National MS Society s SSD Guide for Professionals available at: At a minimum, provide your doctor with the sample letter and guidelines in your SSD Guide. If your doctor does not have a copy of the criteria for evaluating impairments caused by MS used by the SSA, give her a copy from either one of the National MS Society s guidebooks. At every visit, brief your doctor(s) on all of your medical issues or disabilities. Prepare your application You can begin the application process online or by calling Social Security at Download or ask for a starter kit to help you get ready for your disability interview or online application. 3 Review the MS Listing and Criteria Reference in your SSD Guide (Appendix E); refer to this information but describe your MS symptoms in your own words. Use the three worksheets in your SSD Guide to organize your medical history, describe your past jobs and articulate how your MS impairs your ability to work. Applying in person or by telephone has the advantage of giving you a direct contact person for your questions. Applying online allows you to work at your own pace. How to handle an in-person interview Prepare by reviewing all the materials and worksheets you have assembled. Use this material and your journal to explain how your MS symptoms prevent you from working. In your journal, write down what you would like to say in the interview. 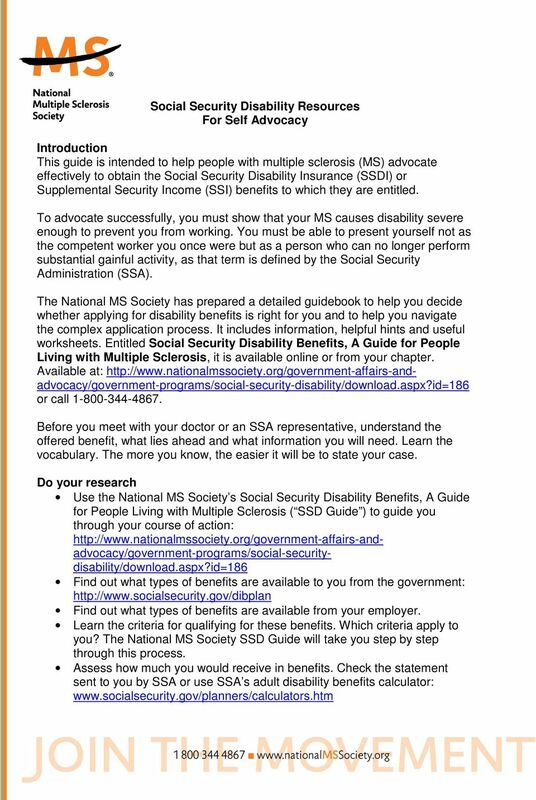 As set out in the SSD Guide, main points could include: I have a severe disability (or several severe disabilities) due to MS. Due to this disability (these disabilities), I cannot work at all. 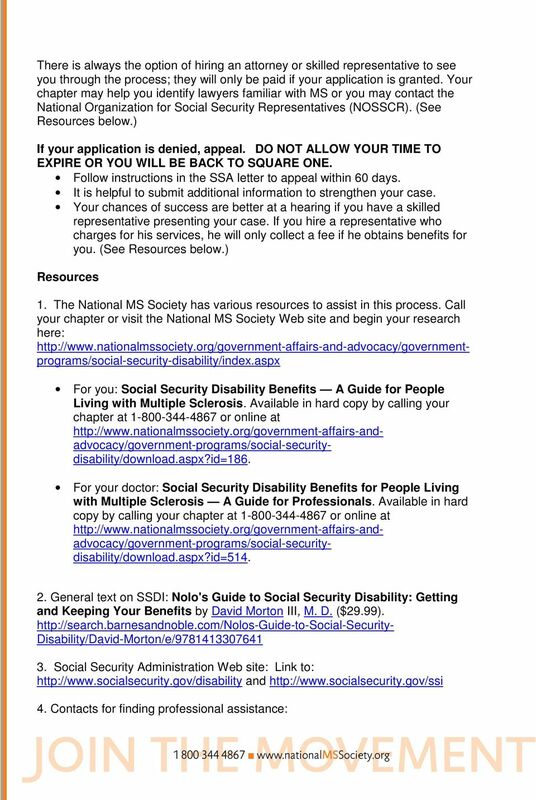 MS is an impairment that is on the Social Security Listing of Impairments. I have a severe disability covered in at least one of the four MS Listing Criteria. Practice your speech until you feel comfortable talking about your personal circumstances. Be sure to bring all necessary materials with you. Make copies of everything you will submit to the SSA. Keep your originals. Ask for your SSA interviewer s contact information so that you can follow up later. 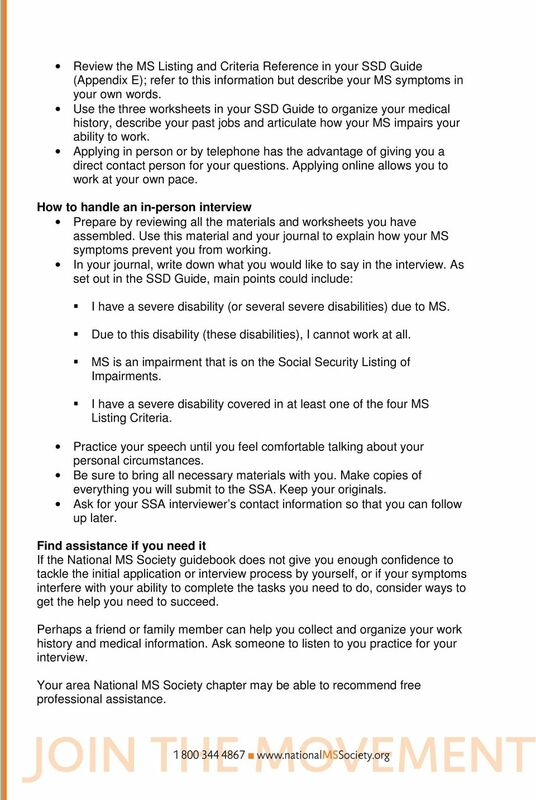 Find assistance if you need it If the National MS Society guidebook does not give you enough confidence to tackle the initial application or interview process by yourself, or if your symptoms interfere with your ability to complete the tasks you need to do, consider ways to get the help you need to succeed. Perhaps a friend or family member can help you collect and organize your work history and medical information. Ask someone to listen to you practice for your interview. Your area National MS Society chapter may be able to recommend free professional assistance. 6 What is Self Advocacy? Self advocacy means speaking up for yourself. It refers to your ability to effectively communicate an interest, desire, need, or right and negotiate to get it. It also means making informed decisions and taking responsibility for them. Effective self-advocates understand individual strengths and needs, identify personal goals, and recognize legal rights and responsibilities. The impact of effective self advocacy reaches far beyond the individual; concrete changes and decision-makers with enlightened perspectives can have a lasting impact on many others as well. Self advocacy throughout life This self advocacy guide discusses effective practices and communication styles for you to best represent yourself and your interests throughout life. Whether you or a loved one lives with multiple sclerosis, effective self advocacy is a life skill sure to improve outcomes, regardless of the need or situation. 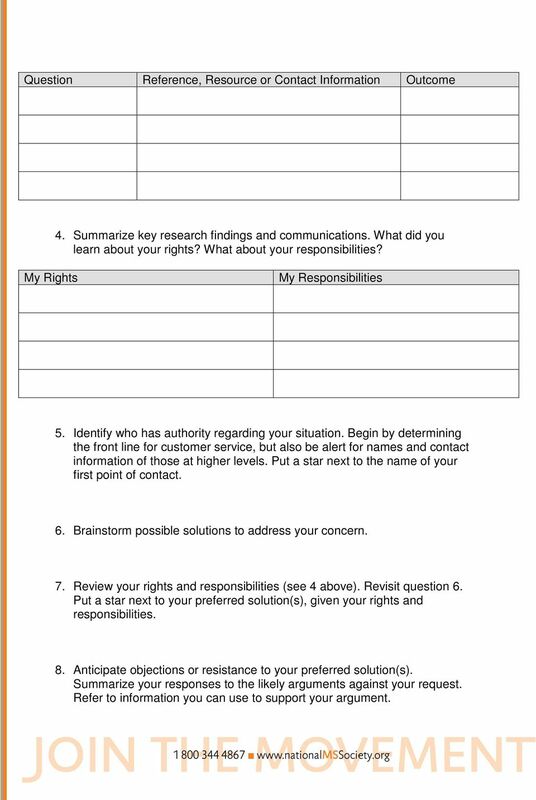 The self advocacy worksheet that accompanies this material is a practical tool to help you turn this information into real-world results. 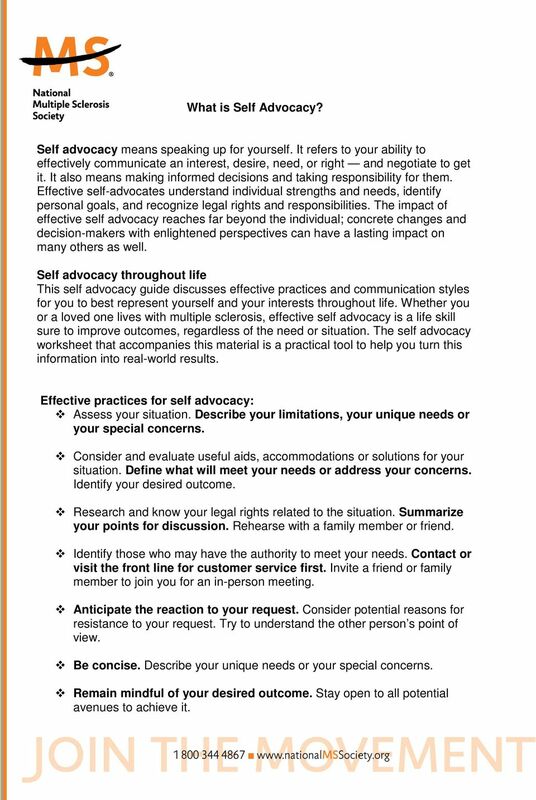 Effective practices for self advocacy: Assess your situation. Describe your limitations, your unique needs or your special concerns. Consider and evaluate useful aids, accommodations or solutions for your situation. Define what will meet your needs or address your concerns. Identify your desired outcome. Research and know your legal rights related to the situation. Summarize your points for discussion. Rehearse with a family member or friend. Identify those who may have the authority to meet your needs. Contact or visit the front line for customer service first. Invite a friend or family member to join you for an in-person meeting. Anticipate the reaction to your request. Consider potential reasons for resistance to your request. Try to understand the other person s point of view. Be concise. Describe your unique needs or your special concerns. Remain mindful of your desired outcome. Stay open to all potential avenues to achieve it. 7 Be honest. Share any positive aspects about your situation or your circumstances which you benefit from, appreciate or value. Cultivating empathetic allies can only help your cause. Document your discussion. 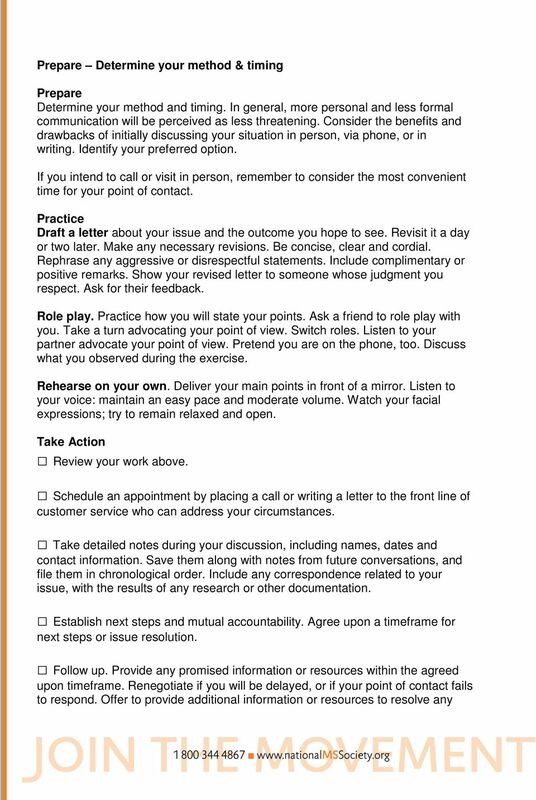 Record the name of the person you speak with, as well as the date, time, key points and necessary follow-up. Be persistent. Identify the next level of authority if you are unable to address your unique needs or concerns during negotiations. Request the decision-maker s response in writing. Know your appeal rights. Be organized in your approach. Use registered mail, keep copies of documents, track dates, take detailed notes, use checklists and make use of any organizational tools or systems that will help you to be more effective. 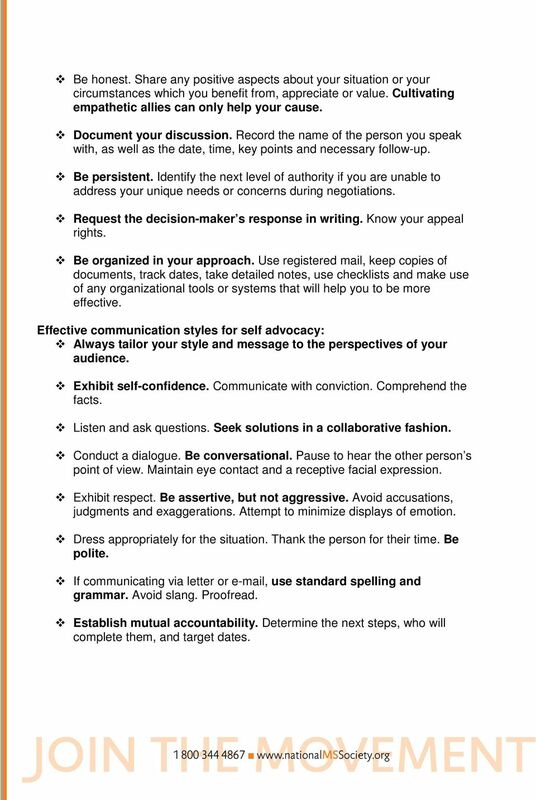 Effective communication styles for self advocacy: Always tailor your style and message to the perspectives of your audience. Exhibit self-confidence. Communicate with conviction. Comprehend the facts. Listen and ask questions. Seek solutions in a collaborative fashion. Conduct a dialogue. Be conversational. Pause to hear the other person s point of view. Maintain eye contact and a receptive facial expression. Exhibit respect. Be assertive, but not aggressive. Avoid accusations, judgments and exaggerations. Attempt to minimize displays of emotion. Dress appropriately for the situation. Thank the person for their time. Be polite. If communicating via letter or , use standard spelling and grammar. Avoid slang. Proofread. Establish mutual accountability. Determine the next steps, who will complete them, and target dates. 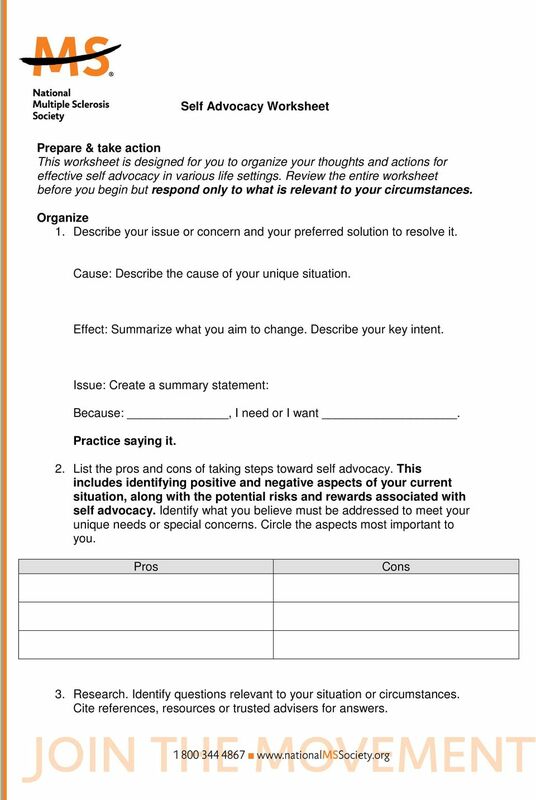 8 Self Advocacy Worksheet Prepare & take action This worksheet is designed for you to organize your thoughts and actions for effective self advocacy in various life settings. Review the entire worksheet before you begin but respond only to what is relevant to your circumstances. Organize 1. Describe your issue or concern and your preferred solution to resolve it. Cause: Describe the cause of your unique situation. Effect: Summarize what you aim to change. Describe your key intent. Issue: Create a summary statement: Because:, I need or I want. Practice saying it. 2. List the pros and cons of taking steps toward self advocacy. This includes identifying positive and negative aspects of your current situation, along with the potential risks and rewards associated with self advocacy. Identify what you believe must be addressed to meet your unique needs or special concerns. Circle the aspects most important to you. Pros Cons 3. Research. Identify questions relevant to your situation or circumstances. Cite references, resources or trusted advisers for answers. 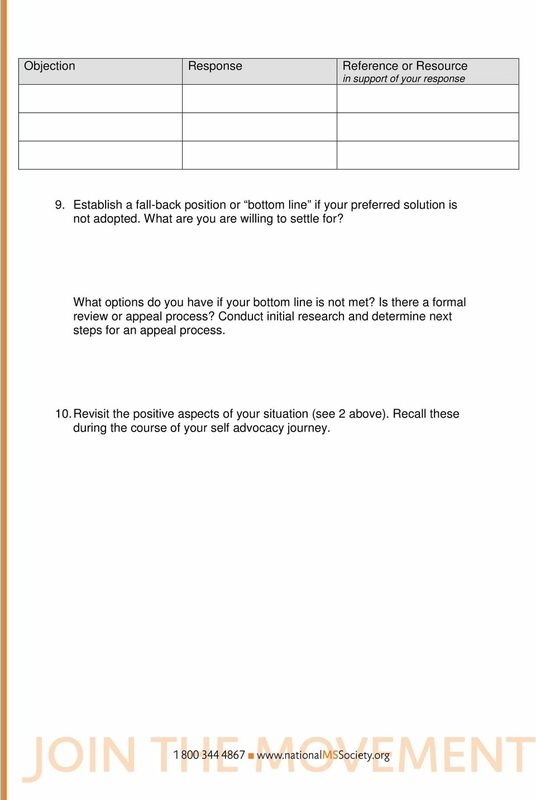 9 Question Reference, Resource or Contact Information Outcome 4. Summarize key research findings and communications. What did you learn about your rights? What about your responsibilities? My Rights My Responsibilities 5. Identify who has authority regarding your situation. Begin by determining the front line for customer service, but also be alert for names and contact information of those at higher levels. Put a star next to the name of your first point of contact. 6. Brainstorm possible solutions to address your concern. 7. Review your rights and responsibilities (see 4 above). Revisit question 6. Put a star next to your preferred solution(s), given your rights and responsibilities. 8. Anticipate objections or resistance to your preferred solution(s). Summarize your responses to the likely arguments against your request. Refer to information you can use to support your argument. 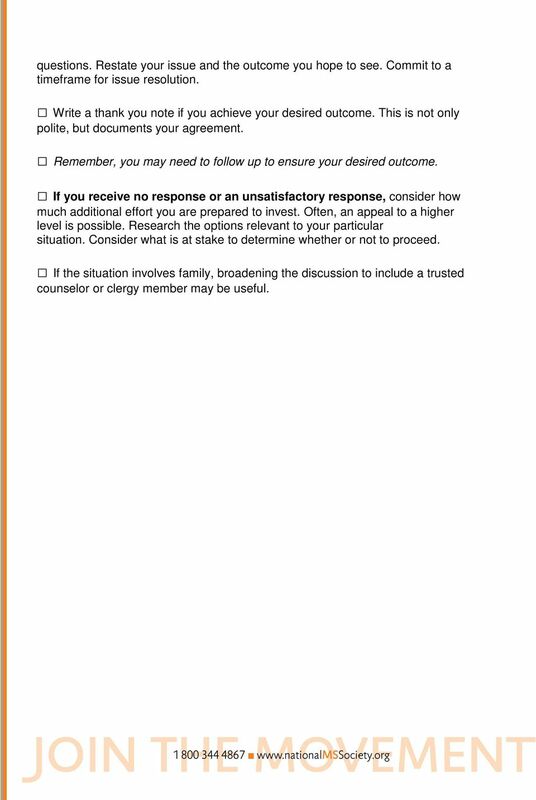 10 Objection Response Reference or Resource in support of your response 9. Establish a fall-back position or bottom line if your preferred solution is not adopted. What are you are willing to settle for? What options do you have if your bottom line is not met? Is there a formal review or appeal process? Conduct initial research and determine next steps for an appeal process. 10. Revisit the positive aspects of your situation (see 2 above). Recall these during the course of your self advocacy journey. 12 questions. Restate your issue and the outcome you hope to see. Commit to a timeframe for issue resolution. Write a thank you note if you achieve your desired outcome. This is not only polite, but documents your agreement. Remember, you may need to follow up to ensure your desired outcome. If you receive no response or an unsatisfactory response, consider how much additional effort you are prepared to invest. Often, an appeal to a higher level is possible. Research the options relevant to your particular situation. Consider what is at stake to determine whether or not to proceed. If the situation involves family, broadening the discussion to include a trusted counselor or clergy member may be useful. Health Insurance, Appeals and Medicare Resources For Self Advocacy Introduction This guide is intended to help people diagnosed with multiple sclerosis better self-advocate for access to health care coverage. TOP 10 SOCIAL SECURITY DISABILITY QUESTIONS 1. How do I apply for Social Security? You can apply for it over the phone, over the internet or in person. If you are disabled and cannot work, do not wait. Law Offices of. 2249 Derby Road (at Sunrise Highway) Baldwin, New York 11510 Telephone (516) 223-5500 Fax (516) 223-5505 www.nelsonlaw. 1) Have your doctor and/or psychiatrist fill out the attached Medical Evaluation Report.